In the Wilmington, NC area, just the mere mention of Landfall conjures images of opulence and exclusivity. Indeed, Landfall is to Wilmington what Park Avenue is to New York City. Ideally situated just one mile from Wrightsville Beach, this private, gated golfing community has been considered the area's premiere residential address since its establishment in 1985. Even Forbes named Landfall one of the "Best Places to Live and Work in America". Click the image below to view Landfall in 360! The Landfall community spans 2,200 acres along the Intracoastal Waterway and Howe's Creek, boasting million dollar homes with stunning views of both Wrightsville Beach and the natural marshes that comprise 320 acres of conservation land. Other homes are nestled near the Country Club of Landfall and its two championship golf courses designed by Jack Nicklaus and Pete Dye. Twenty-nine miles of private roads wind around mature trees and immaculate landscaping, complementing an eclectic array of award-winning architecture. The list of amenities for Landfall residents is endless: three guarded, restricted access gates; 24-hour security patrolling of the private roads; 30 storm water management ponds; sidewalks surrounding the 10-acre Landfall Lake; tennis courts, a fitness facility; an Olympic-sized swimming pool; dedicated hiking trails; and a chapel, just to name a few. 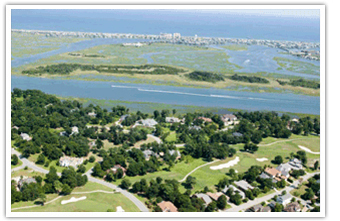 Landfall is one of the only communities of its type on the East coast. Neither a transient community, nor a resort community, most of the property owners live in Landfall year-round, adding to the unique character and ambience of this idyllic private community. Life at Landfall revolves around the Country Club of Landfall and the championship golf courses that anchor this private community. Designed by golf legends Pete Dye and Jack Nicklaus, the golf courses provide a total of 45 holes (27 designed by Nicklaus, 18 designed by Dye). There are separate luxury clubhouses for each course. The Country Club also boasts a state-of-the-art sports complex developed by Tennis Hall of Famer Cliff Drysdale. It includes 14 tennis courts (clay, hard and grass surfaces), an extensive fitness center, and an Olympic sized pool. There are also community recreational facilities and athletic fields for soccer, softball, basketball, volleyball, baseball and community events. Furthermore, there is a 1-mile walking path around Landfall Lake and 2.5 miles of dedicated nature trails in the conservation area. A short 5-minute bike ride across the ICWW Bridge leads you to Wrightsville Beach, one of the most beautiful beaches on the southeast coast. 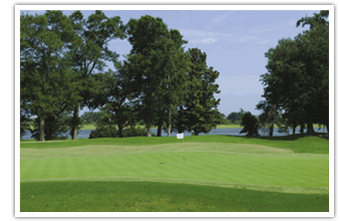 The Country Club of Landfall also provides fine dining opportunities and social events year-round. Its very popular Wine Club is open to all Country Club of Landfall members. In addition to regularly scheduled wine tastings, the Wine Club holds several gourmet dinners throughout the year. Members have the privilege of purchasing wine at a discount that they may take home or store in the Club's wine cellar to be enjoyed at any time while dining at the club. Numerous social groups also use the country club as a meeting spot. Whether it's the Great Oaks Club or the Lunch Bunch (both women's clubs), bridge or Mah-Jongg groups, book clubs, or the investor's club, the Country Club of Landfall is always buzzing with vibrant activity. Meanwhile, quiet reflection can be found at the non-denominational Frank H. Kenan Chapel at Landfall. This interfaith chapel and memorial garden is used for religious activities such as weddings, memorial services, baptisms, recitals and concerts, bible studies, religious education programs, and for individual meditation and prayer. Volunteers and philanthropists will appreciate The Landfall Foundation; a group formed in 1996 to help support Wilmington non-profit organizations. Since its inception, the foundation has raised and contributed over $2,000,000 to small Wilmington non-profit organizations that are often under-funded. Just outside of the Landfall gates, you'll find the area's best gourmet stores, restaurants professional offices and clothing boutiques. Shopping centers include Landfall Center, Mayfaire and The Forum. Venture across the city and you'll find charming historic districts, stimulating cultural offerings, a variety of restaurants, outstanding medical facilities, superb educational institutions, and Wilmington's international airport with non-stop flights to New York, Atlanta, and Chicago. The residents of Landfall span a wide range of ages, professions, and interests. Some are retirees while others are still active career professionals. Landfall is a family-oriented community with some 500 children who keep the community young at heart. Residents hail from 40 different states and 20 different countries. 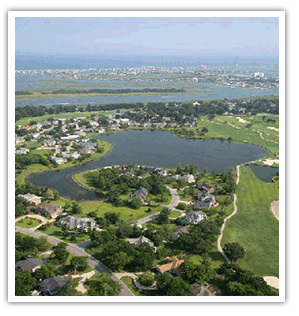 The Landfall community maintains its own intricate infrastructure of homes, roads and walking trails. Common areas, sidewalks, roadways, and medians are cared for by an on-site staff of over 60 employees. As a controlled-access community, there are three entrance gates that are either manned by private security personnel or accessible via a bar-coded entry system, 24 hours a day, 7 days a week. Security personnel respond to resident inquiries, provide assistance to 911 calls, and check homes while homeowners are traveling. Landfall is maintained by a progressive, financially sound, Council of Associations. The Council is responsible for governance and for maintenance of the shared common areas and facilities of the community. Those facilities include two internal postal stations, two playgrounds, two school bus stops, all roads, sidewalks, street lights, storm drains and Security. The Council also maintains all shared common areas, including parks, lakes, and walking trails, and even offers residents yard maintenance services. Additionally, the Council manages an architectural review program that oversees development and encourages diversity in home styles. As the community has grown, so has participation in community family events. The annual Easter Egg Hunt is followed by an elegant brunch at the Country Club of Landfall. 4th of July festivities span an entire weekend, kicking off on July 3rd with a fantastic fireworks display at the Landfall Clubhouse. On the 4th of July, activities include: tug of war, a cake-eating contest, three-legged races, face painting, a dunking booth, tennis and golf events, and a community softball game. There is also a children's parade, a flag raising ceremony with bagpipes, and an old fashioned cookout on the lawn of the Club. Each October, Landfall hosts a Fall Festival, complete with a spooky village, a pumpkin patch, and fall flowers for residents to purchase and plant at home. A quiet, secure private haven in the heart of North Carolina's largest and most diverse coastal community, Landfall is an ideal retreat for retirees. Just 5 minutes away from the ocean at Wrightsville Beach and just 5 minutes to the city's most popular shopping and dining areas, Landfall is perfectly situated to provide a relaxed, yet vibrant and stimulating lifestyle. Landfall's exclusive atmosphere and its convenient location just minutes from the area's best beaches, school, shopping and dining are part of the community's appeal. However, it is the unique homes and estates of Landfall that make it feel so special. There are just over 1,900 lots in this 2,200 acre community with 1,500 architecturally diverse homes ranging in price from $225,000 (for a patio home) to $6,000,000 (for a luxury single-family estate). Homes and home sites are situated amid golf courses, lakes, ponds, creeks, conservation areas, and the Intracoastal Waterway. 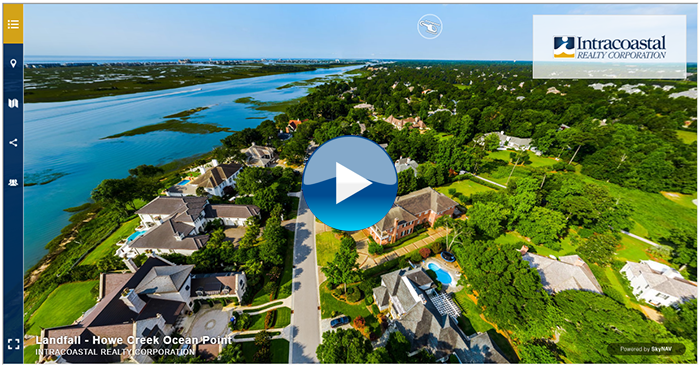 Nearly 4 miles of water front properties offer panoramic views of the Intracoastal Waterway, Howe Creek, and Wrightsville Beach. Landscaping across the rolling fairways includes pines, oaks, hickory, and an abundance of native dogwoods. Lakes, ponds, and a wide variety of vegetative environments complete the gorgeous setting. Whether you choose a patio home in Prestwick, or a sprawling waterfront estate, you're sure to enjoy all of the comforts, security, and amenities that this exclusive coastal golf community has to offer. Considered to be Wilmington's premier address and one of the finest residential and recreational communities in the United States, Landfall truly does have it all. If you would like to be a part of the Landfall community, please Contact Us today. Intracoastal Realty sells more real estate in Landfall than any other company. We have nearly 20 agents who reside inside the gates of Landfall, and many more who know the community intimately. Let us know how we may help you. Ready to Search for Landfall, Wilmington NC Homes for Sale?